The Book Truck increases literacy skills among foster care, homeless, and low-income teens in order to create a pathway out of poverty. We not only teach literacy skills, we create the intrinsic motivation to read. 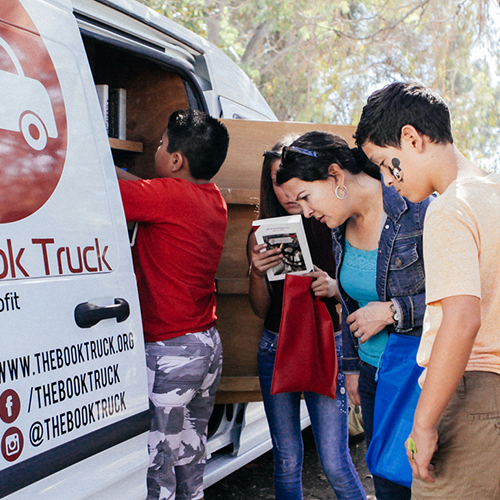 Through our innovative programming, The Book Truck gets teens who have never picked up a book to start reading. Every year, we give thousands of free books to foster care, homeless, and low-income teens throughout Los Angeles County. The importance of literacy is well documented, but at the most basic level, we know that literacy leads to better futures, and everyone deserves that opportunity. Our programming is teen-directed and, by incorporating their feedback, we’ve created unique solutions that go straight to the heart of the teen literacy crisis. The Book Truck’s method uses the three tenets of Self-Determination Theory (Relatedness, Competence, and Autonomy) to activate a teen’s intrinsic motivation to read and increase their literacy skills. Our goal is to break down as many barriers to reading as possible so that every teenager who approaches the truck feels like this is something for them. We designed our programming to encourage even the most reluctant readers. We carry the books that teens want the most and staff our truck with a diverse group of trained teen volunteers who make informed book recommendations to their peers and help them select the “right” book. Empowering teens around books paves the way toward a brighter future. 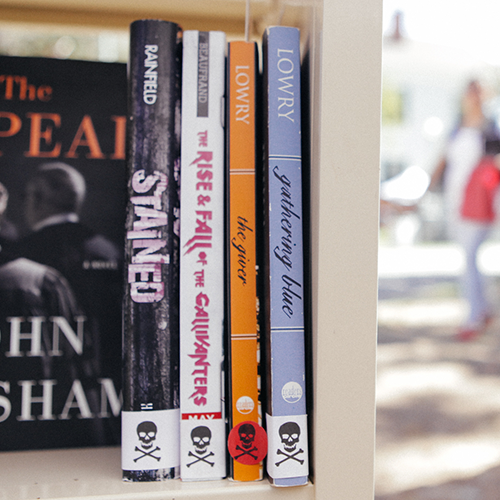 We help teens fall in love with reading who may never do so without The Book Truck, giving them a chance to create a pathway out of poverty. We solve the problems created by Book Deserts. Teens in underserved communities are growing up in Book Deserts. Their communities don’t have bookstores; their schools don’t have libraries; and public libraries are often far away and/or under-utilized (Neuman and Moland 2016). For teens who don’t grow up around books, just knowing how to choose a book for themselves can feel intimidating. The Book Truck brings the books to them. Our truck carries hundreds of the books foster care and low-income teens most want to read. This includes books that tackle difficult subject matters they encounter in their own lives as well as the biggest best-sellers. For some of our teens, these are the first books they’ve ever owned. Learn more about the books we carry. We listened to teens in underserved communities and innovated how to get them reading. That’s where Self-Determination Theory comes in. Research shows that intrinsic motivation, and therefore better educational outcomes, occur when teens are empowered with three things: competence, autonomy, and relatedness. We teach teens the skills and competence to decode and navigate the world of books. We also give teens the autonomy to choose exactly what they want to read from the hundreds of carefully-selected books we carry. Additionally, low-income and foster care teens are deprived a sense of community around reading. We create community and relatedness by using teen volunteers, creating a peer-driven experience, and bringing books that reflect their lives and interests. What is our unique book classification system? We teach teens the skills and competency to decode and navigate the world of books. We also give teens the autonomy to choose exactly what they want to read from the hundreds of carefully-selected books we carry. Additionally, low-income and foster care teens are deprived a sense of community around reading. We create community and relatedness by using teen volunteers, creating a peer-driven experience, and bringing books that reflect their lives and interests.